According to wiki (I know, don’t do research with wikipedia, I’m letting down all of my professors right now, blah blah blah) – it’s a drink that is made from water and vinegar, and then seasoned with ginger, and then sweetened. 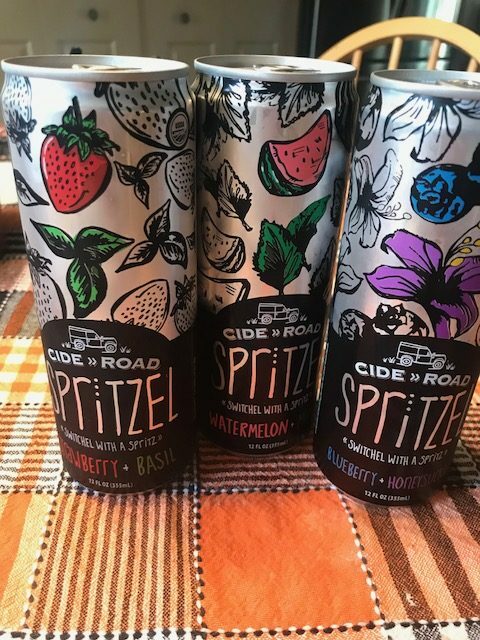 So in comes CideRoad, who sent me a pack of “Spritzel”, which I am assuming is the carbonated version of a Switchel drink– a Sparkling Apple Cider Vinegar drink. 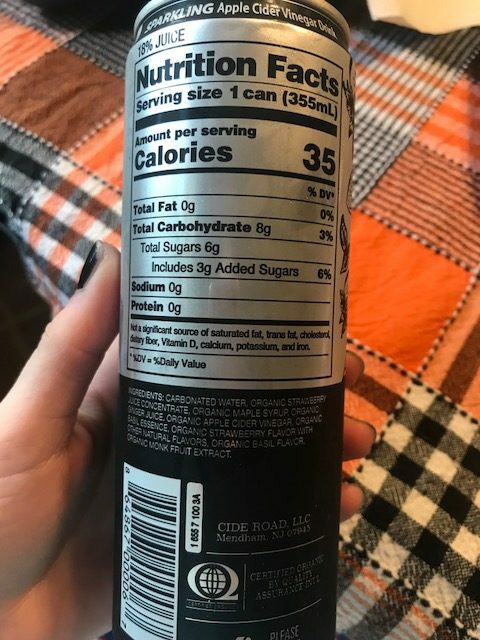 They run you 35 calories for a can. You are instructed to give it a light shake, tap the top a few times, and make sure it is chilled before serving. A quick peek at the ingredients and there is indeed, vinegar, ginger, and other flavors. I will say, all three of these are wildly refreshing. I am not super crazy about diet soda, I do like drinking it with dinner every now and then but I am not the type to down cans of soda all day. Not my thing, and the carbonation is too much. These are carbonated but not to the point where it almost burns your mouth on the first sip. They are all lightly carbonated, and just something about them is so refreshing. They all more or less have the same underlying flavor- you can definitely taste the apple cider vinegar, but it’s not so strong that it is overwhelming and rather quiet mild. I can also definitely taste the ginger tones of flavor with each sip. They aren’t overly sweet, and definitely not “sugary” tasting like some sodas can be. If I had to describe it, they all kind of remind me of more flavorful seltzer, and way more refreshing. The Watermelon + Mint was an interesting combo- I think the mint flavor was a tad more powerful than the watermelon, but you definitely get a hint of both. The Blueberry + Honeysuckle was definitely my favorite– the blueberry flavor really shines through and then you get a nice little hint of honeysuckle at the end. This one seemed a tad sweeter than the others. The Strawberry + Basil was also a hit. Not too sweet, and the basil complimented the strawberry flavor quite nicely. Definitely a pair I wasn’t expecting to work for a drink. Overall, I like these. Definitely worth a try. The flavors can intimidate — mint drink? blueberry flavored sparkling drink? BASIL IN MY DRINK!?! But don’t let it! They are all quite delicious and refreshing. (Im not sure, can I reiterate that they are refreshing again? 🙂 ) Don’t be fooled, they are NOT sweet/sugary, but rather just the right amount of flavor where you can pair it with dinner or just drink it on it’s own. I also really like the can designs… cute. Bravo. DISCLAIMER: I was sent these products for free. This is an unbiased review.